Surviving and Thriving This Winter Season! In November, we gather with friends and family to give thanks for the love, health and gifts we have in our lives. We spend the day cooking, feasting, cleaning, and celebrating. In one day, it is over as we lay our heads down with full bellies and hearts full of gratitude. Then December hits and it can feel like a tornado of new obligations and activities. Each day is a rushing river of to-do lists, shopping to be done, rehearsals to shuttle children to, class parties to attend, get togethers with friends, work parties, travel plans, cooking, baking, cold and flu season, end of the year deadlines at work, wrapping…the list goes on and on and on. Most days feel like an endless merry-go-round rather than the most wonderful time of the year. So, how to find the joy? How to to get off the merry-go-round of full calendars, parties and obligations and find the happiness and joy that this time of year can bring? How do we bring back that full heart of gratitude rather than the ever ending stress? 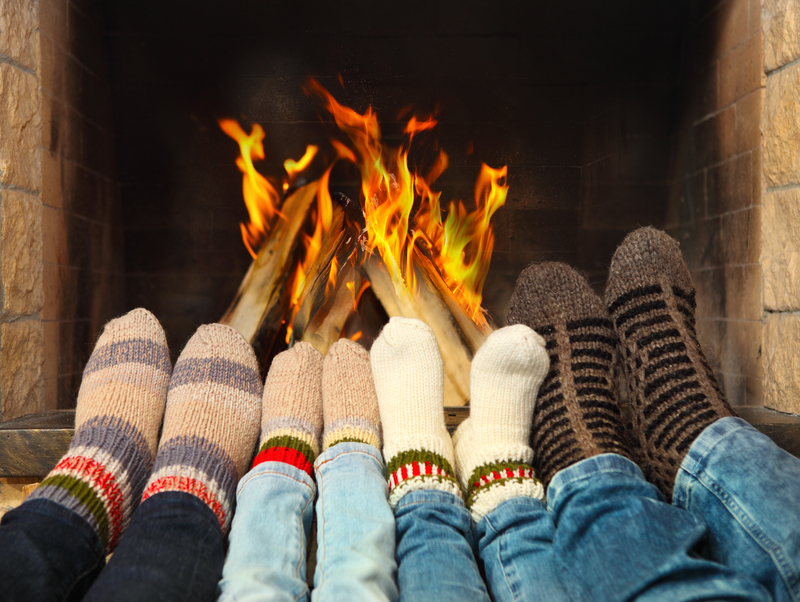 Employing a few tips into your winter routine will not only help to lower your stress, they can also help bring more calm, balance and happiness to you and your family! We breathe all day long without even thinking of it. Thank goodness because we can get so busy we might actually forget! The thing is, we often don’t pay attention to our breath and the extraordinary power it has to support our mental and physical well being. Try setting an alarm on your watch or phone four times a day to remind yourself to take time to intentionally focus on your breath for 1 to 3 minutes. During this time, you can pause, place one hand on your chest and the other on your stomach, just focusing your attention on your inhalations and exhalations. You can even try breathing in for a count of 3 and exhaling out for a count of 5, as science shows a longer exhale helps to calm the parasympathetic nervous system. These small breaks can work wonders to clear your mind, calm your body and give your worried mind a break! supports a sense of calm and joy which lasts much longer than the time of exercise. 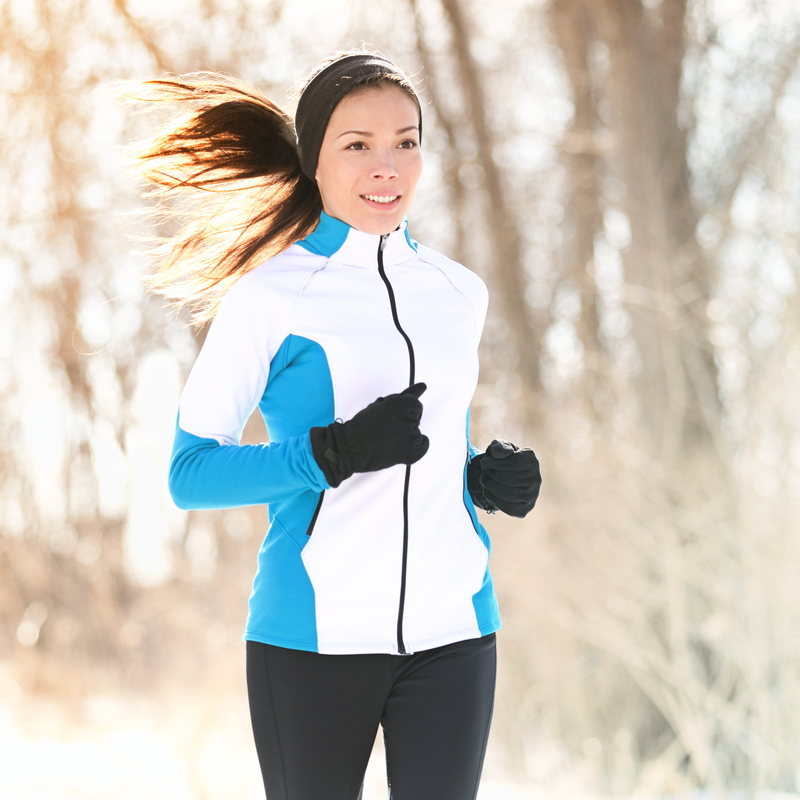 As a bonus, try exercising outside! Researchers have found that spending time in nature reduces stress, anxiety and anger and increases a sense emotional and physical well-being. We spend so much time in November creating “thankful turkeys” in school and expressing gratitude at dinner. Yet, after Thanksgiving, we seem to put this extremely beneficial practice aside. We say, extend this gratitude practice past November! Research has shown that expressing gratitude actually raises happiness levels – who knew? And, did you know that we can’t have feelings of gratitude and anxiety, for example, at the same time? Practicing gratitude has the ability to make us happier and less anxious. Here are some ideas to try: practice finding gratitude in your everyday activities and notice how this feels, keep a gratitude journal each night and spend moments expressing feelings of gratitude from the day at dinner or on the drive home with your family. Looking for and expressing gratitude in this way will eventually become a habit that will bring joy (and numerous health benefits) to you and your entire family! Self-compassion researcher Kristen Neff says, “Sadly, there’s almost no one whom we treat as badly as we treat ourselves.” During this extremely busy and stressful time of year, it can be easy to be hard on ourselves. Are we doing enough for our families? Am I meeting the end of the year deadlines at work? Am I being cheerful enough? Do I look good enough for the holiday activities? The thing is, this self-critic and constant judgment doesn’t make us a better friend, spouse, parent or colleague. Not to mention, it’s exhausting! When you fully engage your senses, the part of the brain responsible for anxiety, stress and worry is given a break. What a relief! During this time of year, when schedules and obligations are overwhelming, we can find ourselves either ruminating over something that didn’t go as planned or worried about what we still have to do. This can be exhausting. When you notice these overwhelming thoughts and feelings, practice engaging one of your senses fully. For example, spend a minute listening to all the sounds around you, letting the sounds just come to you without judgment or labels. Light a scented candle and take several deep, cleansing breaths, really noticing how the smell enters and exits your nose. Hold your warm coffee mug, feeling smooth, warm ceramic in your hands. Spend a meal eating mindfully. This involves slowing down, noticing the colors and shapes of the food on your plate, taking time to really taste the food and paying attention to the textures in your mouth as you chew. Engaging your senses in this way will not only support you in being more present and grateful for the small things in life, it will also help reduce stress and worry! Trying even a few of these accessible and fairly simple practices during this hectic time of year can profoundly effect how you feel and show up for yourself and those around you. Ideally, you’ll go from feeling like a frazzled ball of stress to being more calm, balanced and better able to find the joy and happiness that the holiday season has to offer! 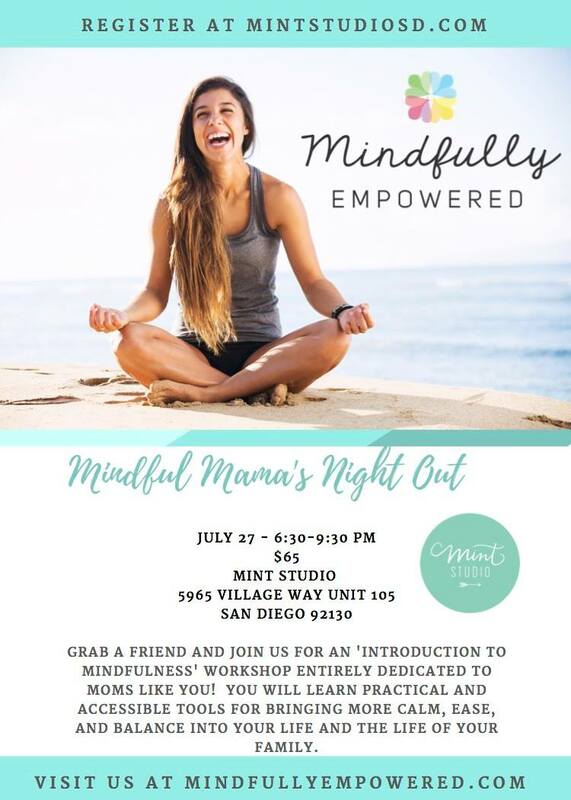 We are so excited to partner with Mint Studio to support mom’s in bringing more calm, balance and ease into their lives and the lives of their families and hope YOU will join us too! Registration can be found at: http://mintstudiosd.com/calendar/2017/7/27/mindful-mamas-night-out. Please feel free to call us at 858.832.4041 or email hello@mindfullyempowered.com with any questions. Raising a child with ADHD can be like living in a fun house…you never know what is around the corner. There are thrills, there are laughs, there are screams. Things are not as they appear and it is scary, wonderful, and exasperating all within 5 minutes. Without strategies for juggling all the changes and challenges, parenting a child with ADHD can feel overwhelming to say the least. For me, finding mindfulness for myself and my children gave us the tools to weather the challenging times with more compassion, patience and resiliency, while also allowing us the awareness to be able to enjoy the great times. 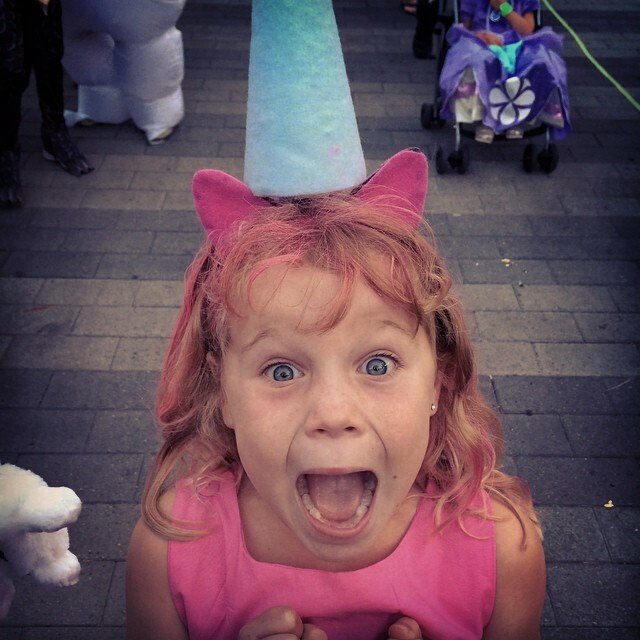 I mean, my kid is hilarious and amazingly empathetic and I need to be in the right frame of mind to be able to really connect with and enjoy her. Currently, there are numerous studies being done showing improvements for those with ADHD in many areas, when they are trained in mindfulness. A study out of UCLA found a marked decrease in hyperactivity and increase in executive functioning. A study by Lydia Zylowska (UCLA) showed 78% of participants noticed a reduction of overall ADHD symptoms when they regularly used mindfulness practices, even practice sessions as short as five minutes. Nirbhay N. Singh, a professor of psychiatry at Virginia Commonwealth University and Director of the Commonwealth Institute for Child and Family Studies, Richmond, Va., and his colleagues performed a study where both mothers of children with ADHD and their children were given training in mindfulness. They found that compliance increased as did positive interactions and happiness in both mothers and their children. Many more studies show the same thing – a mindfulness practice supports children with ADHD and their families in more productive and positive experiences and interactions. When we first started a mindful practice as a family, we had one very specific goal and that was to be able to make a transition (any transition) without screaming and crying (by her or us)! From this one simple goal, our practice grew and changed to meet the very evolving needs of our growing child. We have tackled bedtime, mornings, meal time, classroom work, homework, and sibling interactions to name a few. One thing that has remained constant is a mindful practice as the anchor that we come back to over and over again. Practicing mindfulness has many benefits for a child with ADHD and is a practice that the child can use through his or her life as different challenges present themselves. It is an exciting time to be a brain researcher! Studies have shown that the amygdala, the emotional center of the brain, shrinks and is less active in someone who has a regular mindful practice. Children with ADHD often have great difficulty regulating their emotions and have emotional changes that are fast and furious. Mindfulness gives them the ability to have more awareness and better control over their feelings and responses. As a parent, mindfulness gives us the ability to recognize our own emotional triggers (such as half the contents of the refrigerator on the counter after she “made” breakfast), so we are able to take the time to respond to what we are feeling in a productive manner, rather than a knee-jerk, often fly-off-the-handle, reaction. Trying to keep the attention or focus of a child with ADHD is about as easy as herding cats. Practicing mindfulness supports a child with ADHD in bringing focus back to the present and “being in charge” of the attention. Mindfulness teaches us how to pay attention. Over time, the child is able to notice when attention has wandered and can bring it back. A child with ADHD has many thoughts and feelings that can change rapidly. With mindfulness, we are able to focus our attention more on these ideas and emotions, and are thus better able to help our child navigate through everything going on in his or her mind and body. FMRI studies have shown that a regular mindfulness practice increases the grey matter in the prefrontal cortex. In fact, a recent study out of Harvard University showed an increase in grey matter after only 8 weeks of participation in a mindfulness program. The prefrontal cortex is the area of the brain responsible for executive functioning, which includes planning, critical thinking, problem solving and impulse control. All of these tend to be very difficult for children with ADHD. When children have a mindful practice, they are able to take a pause and respond to a situation rather than react. When they can choose a response, they have better control over their actions and have the mental time to plan and problem solve rather than react impulsively. Children with ADHD often struggle with self-confidence. They are often given negative feedback at school, in sports, and at home about things that are simply very hard for them to control. These negative loops can cause children to have low self-esteem and feel different than their siblings or peers. According to CHAAD, the National Resource on ADHD, 10-30 percent of children with ADHD also have a serious mood disorder, such as depression or anxiety. Dr. Amy Saltzman, a holistic physician and mindfulness coach, conducted a study with 4th through 6th graders. After 8 weeks of mindfulness, the students reported a marked decrease in anxiety. Mindfulness researcher Kristen Neff has found that mindful self-compassion helps to decrease depression, lessen self-judgement and improve emotional well-being. Children are able to learn that thoughts are just thoughts and have no real power. They are able to acknowledge their emotions and feelings without over-identifying with them. Doing this supports children in being able to address the feelings of depression, anxiety or sadness and move on. Mindfulness also supports us as parents in cultivating self-compassion. It is not always easy. We are not perfect and will lose our patience, say something we didn’t mean, or react to our child in a way we wish we hadn’t. Practicing loving-kindness in these moments helps us treat ourselves with compassion and reconnect with our child in a more positive manner. Mindfulness is not a silver bullet for ADHD. It will not alleviate all the challenges. What mindfulness will do is give you and your child tools and experiences that help emphasize the positives and more skillfully address the challenges. It will make the fun house of ADHD a little less unpredictable and a lot more enjoyable! 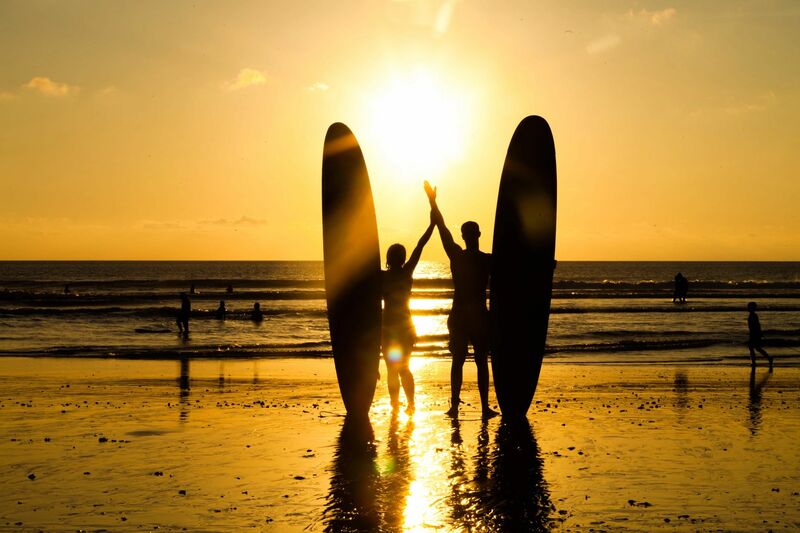 Author and mindfulness pioneer Jon Kabat-Zin states, “You can’t stop the waves, but you can learn how to surf.” Being so close to the beach, we love a good reference to the ocean, but we love the sentiment so much more. Life is full of waves. Happy waves, unsuspected waves, frustrating waves, confusing waves, sad waves, funny waves…the list goes on and on. When we are faced with these waves, we have the opportunity to choose how we will respond, or surf, them. A long, long time ago, when we were cave dwellers fighting every day for food and survival, the amygdala in the brain became very important. The amygdala is the emotional center of the brain, the one that screams “fight, flight or freeze” when we are faced with a stressor. The stress hormone released from the amygdala takes over the rest of our brain. In fact, the people with a really active amygdala were the ones who survived, moved out of the caves, and went on to build generations of offspring. The problem now is that stress is everywhere and it is usually not life threatening, yet our amygdala still has that same strong response. As a society we are faced with more pressures and expectations than ever before and so are our kids. They are expected to get the best grades, be on the “A” soccer team, get the lead in the dance performance, be the top reader, have good friends, excel in math, be starting pitcher in baseball, play the violin, be in honors band…the list goes on and on. Their amygdalas can hardly keep up! We also talk about wanting kids to have “grit” and embrace a growth mindset. Well, this seems extremely challenging when their brains are in a constant reactive state. Every minute is choreographed for them and leaves no space to respond to their emotions or understand how to grow or learn. Author and psychologist Carol Dweck states, “In a growth mindset, people believe that their most basic abilities can be developed through dedication and hard work—brains and talent are just the starting point. This view creates a love of learning and a resilience that is essential for great accomplishment.” A stressed brain can’t learn. A stressed brain can’t be resilient. A stressed brain can’t work hard. A stressed brain can only fight, flight, or freeze. This is what creates the fixed mindset. A calmer brain, however, can learn and can be resilient through responding thoughtfully to stressors and emotions rather than reacting. Mindfulness allows for a pause, and in that pause the person can choose how to respond to a situation rather than reacting emotionally. Mindfulness allows for the person to know that thoughts are just thoughts and have no power. Mindfulness allows for a better understanding of one’s emotions or feelings without assigning one’s value to those emotions. Mindfulness develops self-compassion which allows for facing thoughts or emotions with non-judgment and loving-kindness. Mindfulness supports the ability to cope in a productive way with difficult or challenging emotions without becoming overwhelmed or shutting down. Mindfulness allows for time to observe thoughts and feelings without getting stuck. This empowers people to bounce back. Mindfulness is an organic and productive way to foster a growth mindset while also empowering our children to approach situations and feelings without judgement and with loving-kindness. With these skills, life can throw some big waves at them, even knock them off their boards, but they can get back on over and over and keep surfing. Contact us today to discuss how we can support your school, family, business or community in developing the benefits of a mindfulness practice.